5 × = 25 Required Please enter the correct value. The Dow Jones today is set to retain its winning ways as a flurry of good news propels stocks higher at the open. Investors are happy with the latest GDP growth numbers and reduced fears that the Federal Reserve will hike interest rates. Bloomberg reported Thursday that the United States and China are getting closer to finalizing a trade deal that would eliminate tariffs and improve relations between the world's two largest economies. According to reports, the deal would be completed and signed by both U.S. President Donald Trump and Chinese President Xi Jinping by mid-May. Trade officials have said that both countries are making steady progress on a deal and that more updates are coming soon. 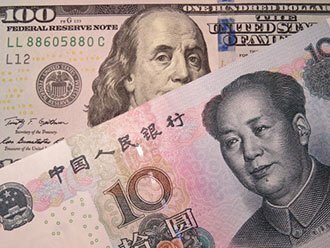 Money Morning Special Contributor Matt Piepenburg shows you how to trade the ongoing developments between the United States and China right here. The earnings season continued today with a wave of news in the retail sector. First, Gap Inc. (NYSE: GPS) announced plans to split into two separate public companies. Its Old Navy brand will become a standalone company, while its Gap and Banana Republic brands remain under the same organization. GPS shares popped 21% on the news. Meanwhile, Nordstrom Inc. (NYSE: JWN) added 1.5% after the firm released a 2019 outlook that topped Wall Street expectations. New York Governor Andrew Cuomo is trying to save a deal with Amazon.com Inc. (NASDAQ: AMZN). According to CNBC, the governor is asking the e-commerce giant to reconsider its decision to abandon a plan to open a second headquarters in Long Island City. Last month, Amazon walked away from a plan to create 25,000 jobs (at an average salary of $150,000) after pushback from local public officials. The company was to receive $3 billion in tax incentives. The New York Times reported Thursday that Cuomo had numerous conversations with Amazon executives about reconsidering company plans. We just held a live event with former Speaker of the House John Boehner and the most powerful people in the cannabis world for one important reason… to help you make a fortune from America's most controversial, misunderstood, and lucrative industry. If you missed seeing this historic event LIVE – and John Boehner's SHOCKING prediction – click here for a special rebroadcast. Shares of Foot Locker Inc. (NYSE: FL) popped more than 12% after the retail chain reported stronger-than-expected earnings. The chain reported adjusted earnings per share of $1.56, well above the $1.40 expected by analysts. The big beat came thanks to a huge jump in same-store sales, which increased by 9.7%. That figure was more than double the 4.6% that was estimated by analysts for the quarter. Tesla Inc. (NASDAQ: TSLA) shares were off more than 4.3% in pre-market trading. The company has been under pressure thanks to an ongoing spat between CEO Elon Musk and the U.S. Securities and Exchange Commission. The firm announced that it will now sell a $35,000 version of its Model 3 and will do so only via the Internet. Musk has also said that he expects his firm to be profitable in the second quarter. A $100,000 investment in Philip Morris 30 years ago would've yielded $4.4 million today if you held on to all of its spin-offs, including Altria Group Inc. (NYSE: MO). The same investment in Apple would've netted you 30% less. Those gains show the power of investing in "sin stocks." With the massive wave of cannabis legalization around the United States, marijuana is the best growth industry out there. We've got the best pick for you right here. On Friday, look for earnings reports from Dentsply Sirona Inc. (NASDAQ: XRAY) and Senior Housing Properties Trust (NYSE: SNH).